Cobra Cuffs Training Pack (3) » Protective Solutions, Inc. 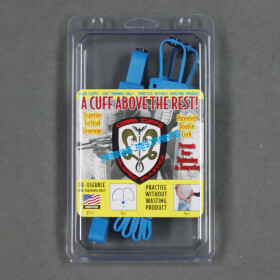 Pack of 3 Re-Useable Training Cuffs allows officers to use Cobra Cuffs in Training Procedures without wasting product. Proper techniques and procedures can be refined using the same design, just without the Double-Lock. Straps simply pull free with minor resistance. Patented, made by MilSpec Plastics.